As we leave Davis Mountains State Park behind and turn the car in the direction of home, I feel a tinge of urgency to get there. It’s a familiar feeling at the end of a trip. Fortunately, we still have a couple of days of fun stops on the way. First up are Balmorhea State Park and Monahans Sand Hills State Park. 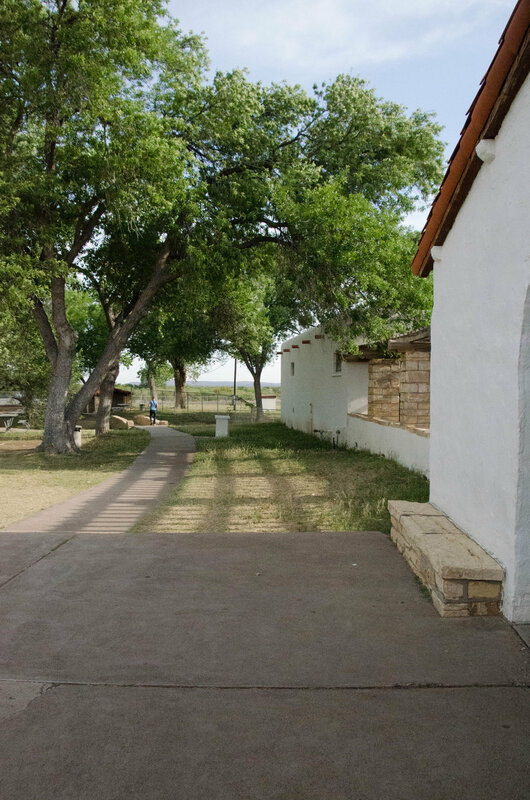 Balmorhea State Park probably owes more to the CCC than any of the other CCC parks in Texas. The defining feature of the park is the spring fed pool, which was built by the Civilian Conservation Corp between 1935 and 1940. It has a year round temperature of 72-76 degrees Fahrenheit (22-24 Celsius) and it happens to be the world’s largest spring fed pool! San Solomon Springs feed the 1.75 acre pool over 15 million gallons of water every day. As the water exits the pool, it enters irrigation canals that continue on to Balmorhea Lake, which then becomes a source of irrigation for thousands of acres of farmland to the east. This water source, in an otherwise arid region, must have made a world of difference to the Native Americans and, later, Mexican farmers in the area. Even today, there’s something slightly surreal about seeing this large basin of water, which apart from providing relief to us humans, also serves as home to both fish and turtles. One of the fish species that lives here exists nowhere else in the world. The park service takes care to ensure their continued well-being. It’s a rare thing to find me anywhere near a pool, but Balmorhea’s pool constitutes a thoroughly unique experience that cannot be passed up. My Mother and I will go for a swim while my Father documents our refreshing adventure. We’ve been warned by a park ranger about the slippery steps leading into the pool, so we maintain a white knuckled grip on the handrail. My Mother chooses to throw herself into the pool as quickly as possible while I select the infinitely more tortuous method of inch-by-inch immersion. For some reason, I had envisioned 74 degrees to be comfortably warm; it’s anything but that. Eventually, I’m in and we swim around for a bit. I’ve been told that most swimmers will feel fish nibbling at their skin. Apparently, we weren’t in the water long enough because we didn’t even see the fish. As we head back to the changing rooms, others arrive with rolling coolers in tow, apparently planning on settling in for the day. I imagine childhood stories about summer days spent in the Balmorhea pool are ubiquitous in this part of Texas. What an amazing treasure this place must be to all who live in the area. As we drive out of the park, we have a look at the CCC built motel type accommodations in the park. 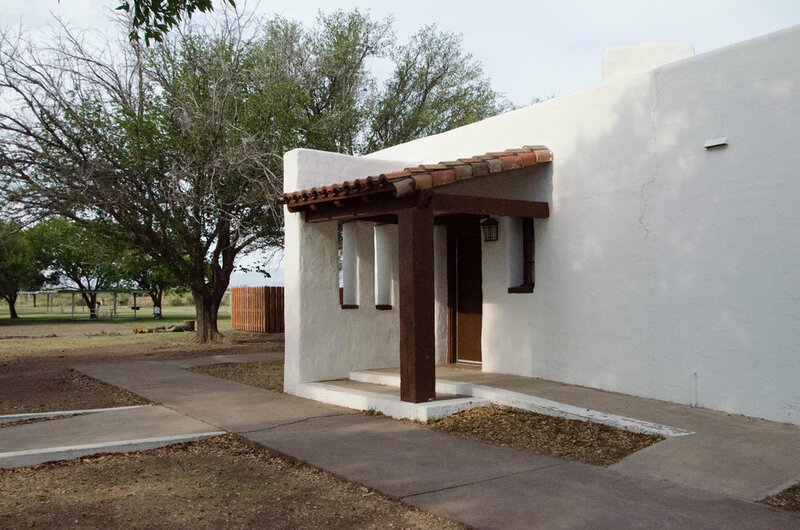 For families with children, Balmorhea State Park seems an ideal base of operations for a West Texas visit. 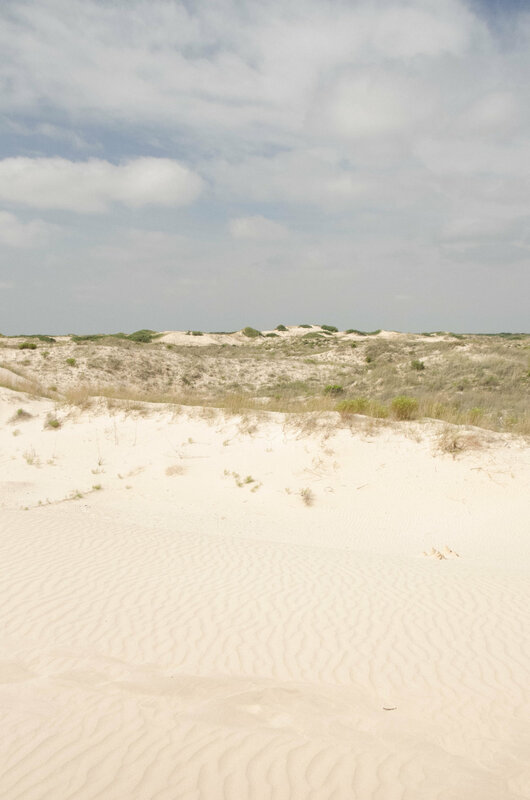 Next up on the day’s itinerary is Monahans Sand Hills State Park. The 3,840 acres of sand dunes in this park are nowhere near as large as the 143,000 acres of White Sands National Monument, located five hours to the west, in New Mexico. Nonetheless, Monahans offers a unique Texas experience, and one I am not about to pass up. After entering the park and driving along the park road, I start to worry that the park might not actually look like the pictures I've seen of it. The sand dunes are definitely there, but small trees have rooted on them, making the dunes seem more green than golden. 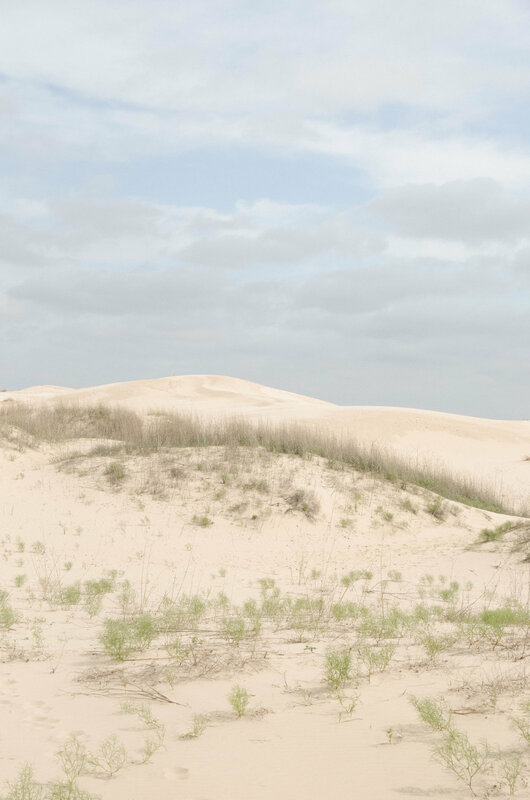 Fortunately, as we drive further into the park, the trees become less prevalent and the dunes grow larger. By the time we reach the end of the road, the dunes have grown huge and possess the wind rippled surfaces I had looked forward to seeing. My parents, having spent 20 years exploring the sand dunes in the United Arab Emirates, are not sufficiently impressed by this smaller scale experience, so I set off to climb the dunes by myself. Strangely enough, I seem to be the only park visitor this day who views this as a nature experience. All around are other visitors, mostly several decades younger than me, who are all busy sliding down the dunes on large plastic discs. Considering the excitement being expressed, and the sound echoing throughout the dunes, it seems a popular way of enjoying the park. Since I’m hoping to get some good pictures, I head toward areas still clear of foot prints. Excavations performed at Monahans have revealed that Native Americans made use of this area from around 12,000 years ago and up until the late 1800s. 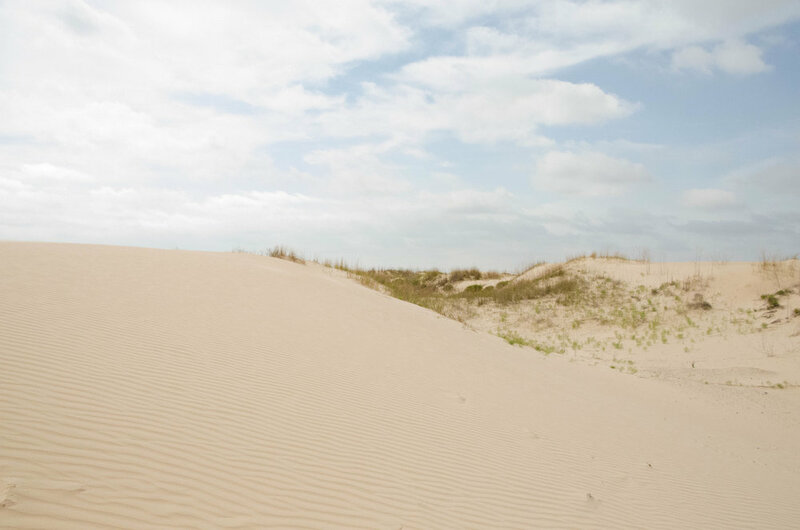 Getting lost in the dunes would be very easy if you happen to be unfamiliar with them, but if you know your way around, it would be the perfect place to hide a camp from people who might prove a threat. Still, with minimal plant life, finding food would seem an issue. In the end, the Native Americans discovered the secret to survival here, the same way the bedouins did on the other side of the world. Despite all our knowledge and technology, most of us today would quickly perish if we found ourselves alone in an environment like this. When we travel in Europe, history is always present. There’s nothing I love more than to walk along streets that bring me closer to the lives of people who lived hundreds of years ago and recognizing the changes wrought by the passage of time. In the large empty expanses of West Texas, the concept of time takes on a whole new meaning. The well of time no longer ends in bedrock; if you fall in, you’ll free fall back to the fiery beginnings of Earth. There’s an epic enormity to the way this region makes me feel. It’s an intangible thing, almost impossible to describe, but if you go there, you’re likely to recognize what I’m doing my best to express. By the time evening comes, we find ourselves back in the Hill Country. The following day, we have a visit to Wild Seed Farms in Fredericksburg to look forward to.